Due to increase in circulation of black money and evasion of stamp duty the state governments periodically fix and revise circle rates. To check black money in transactions the circle rates were revised in Nov 2012 by up to 200 per cent. Category A Rs. 645,000 Anand Niketan, Friends Colony, Golf Links, Kalindi Colony, Maharani Bagh, Panchsheel Park, Shanti Niketan, Sunder Nagar and Vasant Vihar. Category B Rs.204,600 Anand Lok, Andrews Ganj, Defence Colony, Greater Kailash-I, Greater Kailash-II, Greater Kailash-III, Greater Kailash-IV, Green Park, Gulmohar Park, Hamdard Nagar, Hauz Khas, Maurice Nagar, Neeti Bagh, Nehru Enclave, Nizamuddin East, Pamposh Enclave, Safdarjang Enclave, Sarvapriya Vihar and Sarvodaya Enclave. Category C Rs. 133,200 Alaknanda, Chittaranjan Park, Civil Lines, East of Kailash, East Patel Nagar, Jhandewalan Area, Kailash Hill, Kalkaji, Lajpat Nagar-I, II, III & IV, Malviya Nagar, Masjid Moth, DDA Flats, Munirka DDA Flats, Nizamuddin West, Panchsheel Extension, Punjabi Bagh, Som Vihar and Vasant Kunj. Category D Rs. 106,400 Anand Vihar, Daryaganj, Dwarka, East End Apartments, Gagan Vihar, Hudson Line, Indraprastha Extension, Janakpuri, Jangpura-A, Jangpura Extension, Jasola Vihar, Karol Bagh, Kirti Nagar, Mayur Vihar, New Rajinder Nagar, Old Rajinder Nagar and Rajouri Garden. Category E Rs. 58,400 Chandni Chowk, East End Enclave, Gagan Vihar Extension, Hauz Qazi, Jama Masjid, Kashmere Gate, Khirki Extension, Madhuban Enclave, Mahavir Nagar, Moti Nagar, Pahar Ganj, Pandav Nagar, Rohini and Sarai Rihilla. Category F Rs. 47,200 It includes Anand Parbat, Arjun Nagar, Daya Basti n Dilshad Colony, Dilshad Garden, BR Amdedkar Colony, Ganesh Nagar, Govindpuri, Hari Nagar, Jangpura-B, Madhu Vihar, Majnu Ka Tila, Mukheree Park Extension, Nand Nagri, Uttam Nagar and Zakir Nagar (Okhla). Category H Rs. 19,400 Sultanpur Majra. Within a year, circle rates of land in category A properties have tripled from Rs 2, 15,000 per square metre to the current rate of Rs 6, 45,000 per square metre. 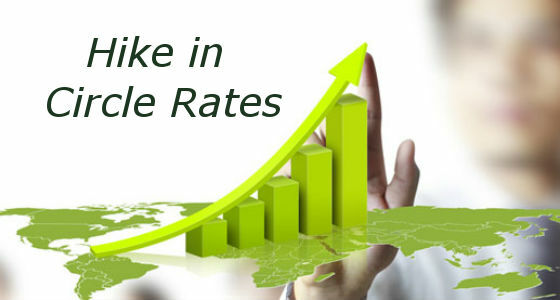 The circle rates of other categories have also increased but not in such high proportion as that of category A.
Circle rates are now much higher than the market rates in New Friends Colony and some parts of the Lutyens’ Bungalow Zone. The new circle rate in New Friends Colony is Rs 542,017 per sq yd. whereas the market rate around Rs 450,000 per sq yd. meaning a house of Rs 22.5 crores will be priced at about Rs 27.1 crores on the basis of the circle rate. The good news is that the market is regulated now and the market rates are hovering around the circle rate. The bad news is that if you don’t have money in white, then you will face a problem in buying .We think that in the long term, it is a good move by the government, and along with the real estate regulatory bill we spoke of last week,it will bode well for the future of the real estate market in Delhi.